Summer is the season of beautiful colors and trends in lawn dresses and the designers are devoted to bring latest designs for ladies to wear in upcoming Eid season. Embroidery on lawn dresses is on peak for trends 2017. 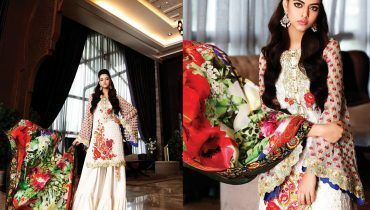 Pakistani girls and women are crazy for designer embroidery lawn dresses. They spend a considerable time in searching latest trends on internet and how to find their desired fashion item or favorite designer dress from the brand stores. Sahil’s designer embroidered lawn dresses are winning the hearts of women and girls of all ages, and these beautiful colors are attracting them to grab those designer lawn dresses. Embroidered lawn dresses in trendy blue, pink, olive, brown, and grey colors will definitely become your choice. Have a look at the Sahil’s recently launched designer embroidered lawn dresses for this summer, vol 8.